The 2016 edition of Midwest UX took over downtown Louisville for three days in October. Between October 20th and 22nd the audience was wowed by a series of speakers exploring the boundaries of user experience in the region. Day one of the main conference slate began with a challenge by Janice Fraser to stop ignoring the blind spots in the field. User experience professionals need to be working with their teams rather than considering themselves a silo for all design decisions. Chris Avore advocates for something that all user experience researchers should support. Rather than acting as the only resource for research rely on other people throughout your organization to build research into the culture. With the advent of voice assistants and chat bots user experience professionals have a new design constraint to consider. Elena Ontiveras unpacks her experiences at Facebook and ways that people can start to build meaningful interactions into their systems. 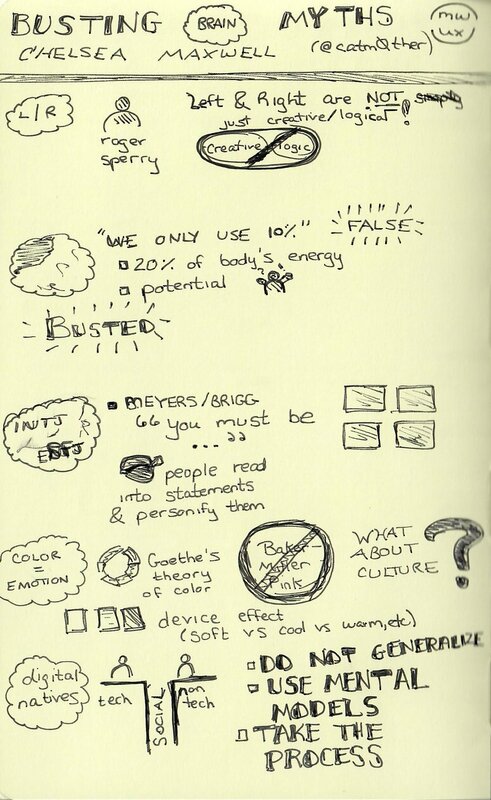 “Even smart people use about 10% of their brain’s capacity.” Chelsea Maxwell busts this myth and others having to do with color, emotion, and the dichomoty between “left brained” creative people and “right brained” practical thinkers. In Donna Lichaw’s recent release The User’s Journey she explains how we can use narratives to engage stakeholders and build shared understanding through the lifecycle of projects. This talk distills the essence of that book into a condensed summary which should be a must see for anyone doing user experience in the real world. Kurt Vonnegut is one of the greatest writers of the 20th century. 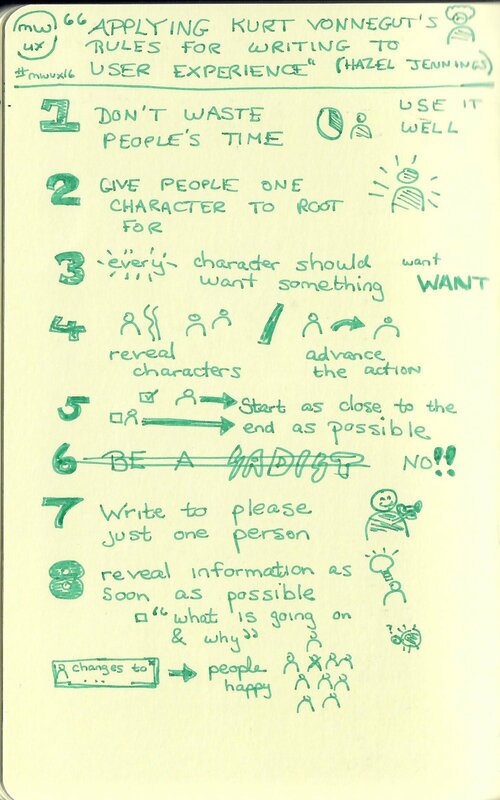 His eight rules of writing provide a great foundation for any aspiring (or successful) writer to follow in their work. In this presentation Hazel Jennings applies these lessons to user experience practice. Wayfinding and information architecture have a long history. Linn Vizard examines how maps, which inform our sense of place in the physical world, can reach us how to build senses of place in the digital environment. In the final keynore Steve Baty asks the hard questions about the role of designers in the design process. What can we do to humanize the process and make it a shared practice that focuses on users first instead of a cool flashy product?